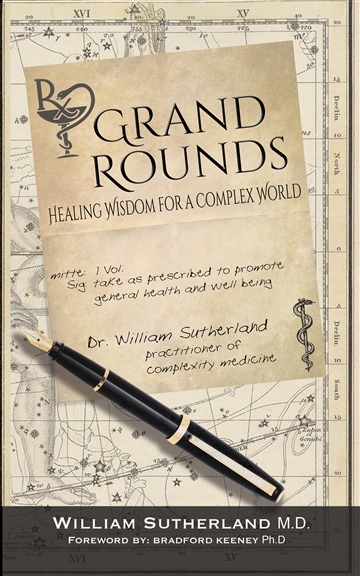 Dr. William Sutherland is the innovator of the Complexity Medicine concept and the founder of the Institute for Complexity & Connection Medicine. Moved by the spirit of Lewis Carroll, Dr Sutherland found himself going down the rabbit hole from an early age, each path taking him to another door, each door to another world. Bonded to his Jazz drumming grandfather in his childhood, fascinated and pulled by the natural world, later to be immersed and schooled into the martial ways of Japan and from there spring boarding into a deep mentorship into indigenous and traditional healing ways around the globe; all of this was to serve as the foundation for a future career in medicine, the seed of which was always present from the start. Holism, of course is funny that way, it inevitably finds you and once so enticed, does not let go, and having caught hold of you, you can never see the world again in a disenchanted, dispassionate way. As well, it becomes the shaper of everything you do, and of everything you perceive. It is these living verities and experiential truths that have served to shape Dr. Sutherland throughout his healing journey and path of discovery, and are what have formed the foundation for the bringing forth of a medicine that is the embodiment of complexity and wholeness, that is to say a Complexity Medicine. Presently, Dr. Sutherland is an Adjunct Assistant Clinical Professor at McMaster University and a Research Fellow at the Waterloo Institute for Complexity and Innovation. As well, his clinical practice time includes general practice psychotherapy, functional medicine, and emergency department care. In all of these diverse clinical settings, he works to embody and impart the feeling central to a practice of Complexity Medicine. Moreover, he is the father of four children, an avid gardener, and a blessed husband who lovely wife Lisa gently and artfully helps him to remember to apply his principles of holism in medicine to the broader aspects of his life.